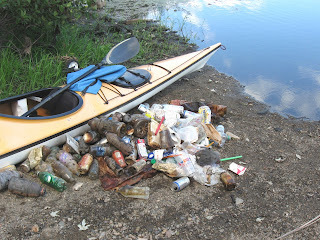 Late this morning, under blue skies dotted with puffy white clouds I trash paddled a section of the Sudbury River in Wayland. Compared to all the hot weather we've been having, today almost had the feel of autumn with a busy wind out of the northwest..
After passing under Rt. 20 and the old railroad trestle, I came upon a new river entry spot for Wash Brook... Perhaps the brook's usual route through the culvert under the RR embankment, located to the west, is blocked. Folks kept on depositing trash even though the barrel was full. I'm not sure who owns the barrel but hopefully they'll be by soon to empty or remove it. I picked up the stuff that had blown onto the ground and removed the lightest trash from above the barrel's top. This is probably a good example of how trash often gets into a waterbody from dumpsters and other trash containers without adequate covers. The trash I captured here was fairly new whereas the rest of what I saw today had been under water for quite some time. One container was an old Sterling Farms Milk Co., Jamaica Plain 1-quart bottle. It was the type that had the paper/wax seal that the milkman used to deliver in bygone days. Aside from some staining it was perfectly intact. The only other boat seen today was a small power boat carrying a fisherman who reported the fishing was great! He'd caught several good sized bass and also several pickerel. The reason for such good fishing, as he explained it, was because the the fish are confined to a much smaller area due to the low water levels. Great blue herons were also enjoying this situation. Other wildlife seen today were belted kingfishers, numerous killdeer, musquashes, several good-sized snapping turtles, loads of painted turtles, and a lone cormorant standing on the shore as if he were a heron. Today's catch was 136 pieces of trash. The breakdown: 76 recyclable containers (26 redeemable) and 60 pieces of misc. 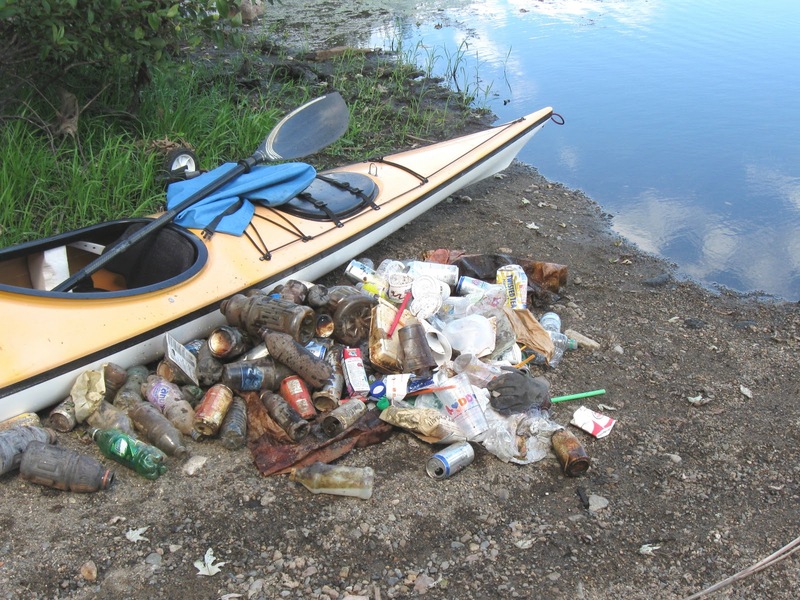 rubbish such as styrofoam, plastic bags, and a large sheet of what looks like silt fence. My YTD total stands at 3665.